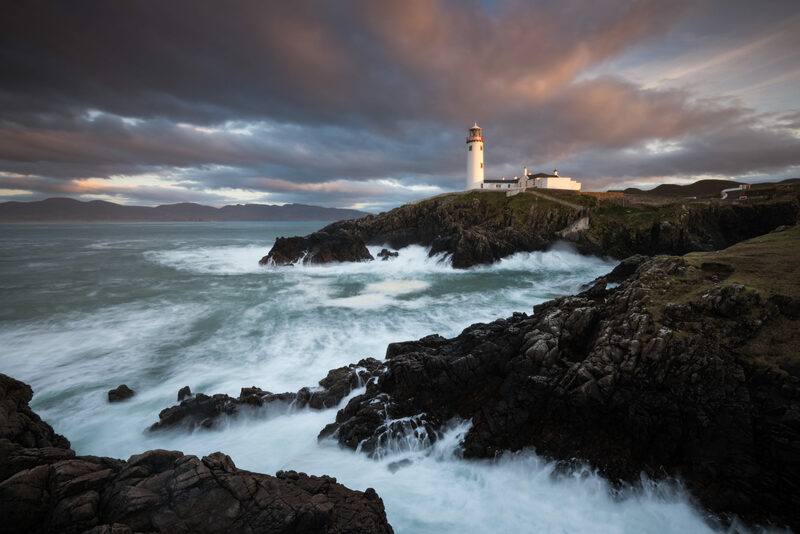 The image above was crafted at Fanad Head Lighthouse in Donegal. It is not the image I set out to create that evening. The events that unfolded demonstrate why it is always good to have a Plan B. The day in question was overcast in Donegal but I knew the sun was shining in every other area of Ireland. I set out to capture a beautiful long exposure image at The Great Pollet Arch while conditions were still overcast which suits that style of shooting. I had been there once before on a dull, grey, wet and miserable day and come home empty handed. On arrival, I realised today was not the day. The tide was just too far in. No matter what I tried, I could not make the composition work and the tide was starting to close off the exit route behind me. Time to call it a day here and try something else. Fanad Lighthouse is about an hour from Letterkenny but only 10 minutes from the Pollet Arch. It is one of the most photographed scenes in Ireland despite its remote location. I’d never been and was not even too sure the light would come from the right direction, even if it were to appear but as usual, I took a chance rather than come home with nothing. I’d never been overly keen on shooting this area as so many have done it before me but what the hell…..
On arrival, I could see cloud starting to break and I knew chances of making something good were improving. The sun would hit the light house perfectly if it could break through. However, it was my first time there, I was late and I had no idea where to position myself. I made my way down and found a spot on the low rocks and composed an image. It just wasn’t speaking to me and the light was starting to get really good. I had two choices, stick with it and capture the light unfolding with a composition I did not love or find a better composition but risk missing the lightshow. Another change in plan. I made my move quickly and just in time. I no sooner had the camera positioned when the lighthouse started to glow thanks to a break in the cloud allowing the setting sun to beautifully side light it. It lasted 2 minutes and then disappeared for the evening. I knew instantly I had the image in the bag. It is a classic image and a perfect example of the elements combining at one moment in time. Dramatic clouds in the background, breaking waves over rocks in the foreground, and a beautifully lit lighthouse. The setting sun helped add vibrant colour to the scene. If it were only this easy all the time…. I have no doubt Fanad Head Lighthouse is a difficult location to master. In conversation with another photographer the following day, he informed me he has visited countless times and never had a break with the light. I appreciate I was on location exactly at the right time when luck played a huge element in the creation of the image. I have no doubt “Fanad Head Lighthouse” will be one of my annual favourites for 2017.